Now I think if we're all honest we'd admit to being partial to a smidge of over-indulgent #Selfie one-on-one action! Whether that be a cheeky snap to a boyfriend or girlfriend, a 'how do I look' capture before a night out or a holiday smoast lazing on a lounger cocktail in hand! The self-portrait of the digital age swept the world hard back in 2012 and continues to reign in a royal fashion. And it's not just starlets, popstars and models getting involved in this photographic phenomenon... Jules of Sincerely Jules (one of our must-read fashion blogs) has taken this trend to the next level and created the ultimate fashion blogger tee with a twist! 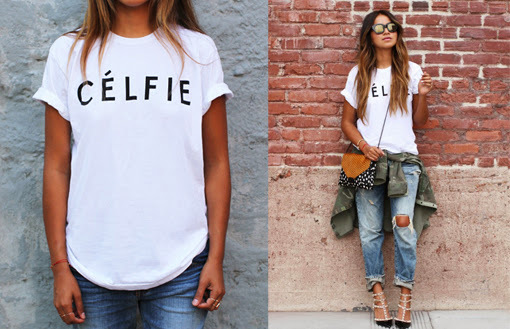 Playing on the Céline craze and the #Selfie sensation she's designed... wait for it... the ‘Célfie’ tee - genius!! !